So I have this coworker. Her office is next to mine, which is across the hall from the staff kitchen. Which is where I stash my treats when I bake something for the office. For either of us to get anywhere in the building, we have to walk by the corner of the counter where I put the treats I made, and am depending on my coworkers to eat up so I don’t gain 300 pounds. A day. Since I am giving away the treats, it’s easy enough for me to deny grabbing one or two, or 10, throughout the course of the day. And chances are good that I spent the previous evening sampling one or two, or 10, for quality control purposes. I mean, I work with these people Monday-Friday. I can’t get a reputation for brining in substandard goodies, now can I? So while, for me, the proximity to the kitchen, and my treats, is no big deal, I’ve slowly come to realize something about my coworker. I’ve become her food drug dealer. It started out innocently enough, a pan of brownies here, a few cake pops there. But over the course of a year and 5 months, I’ve slowly conditioned my coworker to expect treats on a semi-regular basis. And I know when she’s ready for her next fix. Case in point: this conversation, taking place a week before Martin Luther King Jr. Day. Coworker: So, when are you bringing more treats in? Me: Hmm…well I might be making something over the long weekend. Coworker: You should make some treats. For Martin Luther King Jr. Day. Me: Really? Is there a traditional treat you make for that occasion? Coworker: No. I just want some treats. I know! You should make something with like…chocolate and vanilla, or cheesecake. Black and white! For racial equality! For MLK Day! That was when I realized what I had done to this poor woman. I can justify pretty much anything, but even I hadn’t thought of using racial equality to justify treats. But hey, who am I to argue with civil rights? So, let’s raise an Oreo cheesecake bar and make a toast to equality, freedom, and dreaming of brighter futures for us all. 1. Preheat your oven to 325°F. Line a 9 x 13-inch pan with foil, and set aside. 2. Start with the crust! Place 2 of the 3 rows of Oreos in a food processor and process until you have fine crumbs. You want a sand-like consistency. Pour the crumbs into a bowl, add the melted butter, and stir until all the crumbs are moistened and stick together when pressed gently. 3. Pour the crumb mixture into the lined pan and, using your fingers, press the mixture evenly into the bottom. Bake 10 minutes, then remove to a wire cooling rack (leave the oven on) while you make the filling. 3. In a large bowl, using an electric mixer, beat the cream cheese and the sugar until completely mixed. Next, add in the sour cream and vanilla. Then, add the eggs, one at a time, beating well after each addition. Once you get all the ingredients in, scrape down the sides of the bowl with a spatula, just to make sure you got all the good stuff in there. 4. Put the remaining 1/3 of your Oreos in the food processor, and give it a few quick pulses to break them into large chunks. 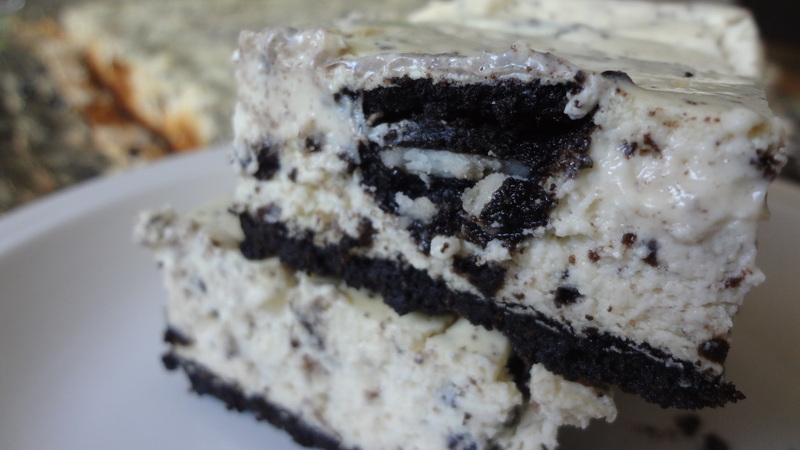 Fold the chopped Oreos into the cheesecake batter. 5. Pour the batter over the baked cookie crust, and tap it lightly on the counter a few times to make sure it’s evenly distributed. Bake the whole thing for 40 minutes, or until the filling is set around the edges but still slightly wobbly in the center when you gently shake the pan. Remove the pan to a wire rack to cool to room temperature, about 1 hour. Once it’s cool, cover it and refrigerate it for at least 2 hours before serving. 6. To cut, use the foil overhang to lift the cheesecake out of the pan and place the cheesecake slab (yum!) on a large cutting board. Use a sharp chef’s knife to cut the cheesecake into bars, rinsing off the knife with hot water and wiping it dry between each cut. This will prevent the cheesecake from clumping on the knife, and give you cleanly cut bars. 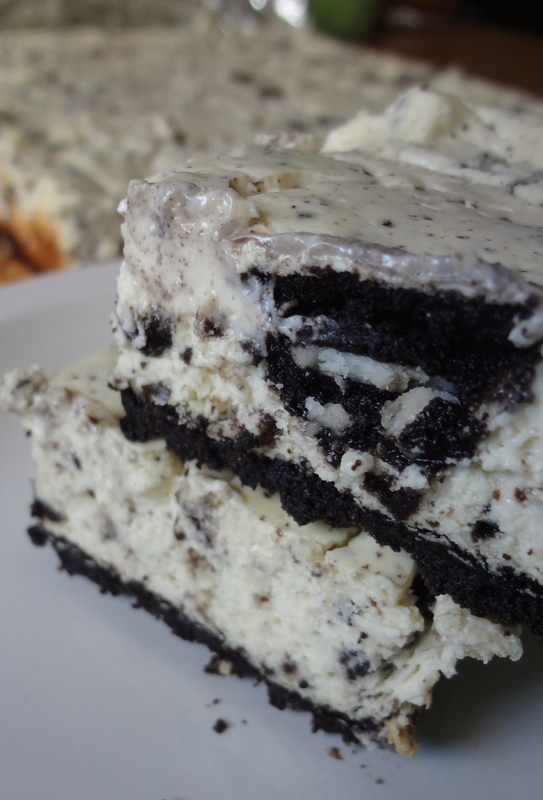 This entry was posted in Uncategorized and tagged Baking, bars, Cheesecake, cookies and cream bars, cookies and cream cheesecake, Oreo cheesecake bars, Oreos by theculinarycapers. Bookmark the permalink.